Rashida Shaw '99, instructor of theater, recently completed a four-year ethnographic study of black audiences attending contemporary Urban Circuit productions in Chicago. 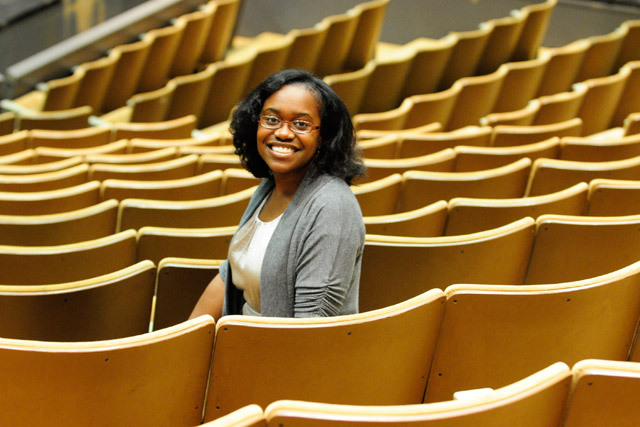 Wesleyan alumna Rashida Shaw ’99 returned to her alma mater this fall as an instructor of theater. Shaw, who graduated with a bachelor of arts in sociology and theater from Wesleyan, also has a master of arts in theater from Northwestern University. She will receive an interdisciplinary Ph.D. in theater and drama from Northwestern’s Theater and Drama Program in Spring 2011. 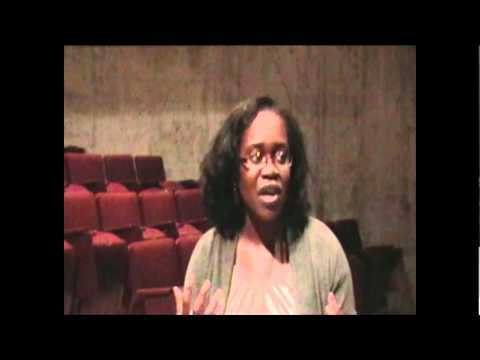 Upon completion of her dissertation, titled “Theatrical Events and African American Audiences: A Study of Contemporary ‘Chitlin Circuit’ Theatre,” Shaw will become a tenure-track assistant professor of theater at Wesleyan (view video below). Her areas of specialization include African American and African Diaspora theater and performance, black musical theater, theatrical spectatorship, ethnography, cultural studies, popular culture, critical race theory, and gender and sexuality theory. She’s also an expert on the contemporary Chitlin Circuit, also popularly referred to as the “Urban Circuit.” Successful circuit playwrights include Je’Caryous Johnson, Tyler Perry, and David Talbert. Shaw’s dissertation study is one of the first to discuss the dynamics of black theatrical spectatorship at length within the context of a particular venue, city, and socio-cultural factors. Her four-year ethnographic study of black audiences attending these plays in Chicago enables a closer investigation into the ways in which representations of race, gender, sexuality, popular culture, and black vernacular practices manifest on contemporary American theater stages and significantly uncovers how and why contemporary black spectators identify with and make meaning of these representations. This project complicates existing theater reception studies as it considers the implications of race, culture and place by making relevant the objectives and contemporary realities of understudied African American spectators and the impact of the socio-cultural spaces within theater houses and their location within cities. While a student at Wesleyan, St. Croix, Virgin Islands-native Shaw focused her thesis on color-blind casting from the perspective of the black actor. “As an alumna, Wesleyan has always been significant to me,” she says. “Wesleyan was my first time living ‘on my own,’ and it was the first time that I was able to learn, engage and explore with knowledge and performance in ways that were motivated by my own interests,” she says. She took these interests with her to graduate school where she purposefully pursued an interdisciplinary mode of investigating the dynamics of black theater and performance. Shaw gained her teaching experience instructing student actors at Northwestern’s Department of Theatre in 2007-09. She worked as a lecturer at Grinnell College’s Department of Theatre and Dance in 2009-10. Shaw is the author of five published articles including‚ “Insert [Chitlin Circuit] here: Teaching an Inclusive African American Theatre Course,” published in Theater Topics, 2009. She received a graduate research grant and a teaching fellowship from Northwestern in 2008; and a dissertation fellowship from the Consortium for Faculty Diversity at Liberal Arts Colleges in 2009-10. Her host institution for the fellowship was Grinnell College. In 2010, Shaw was an invited panelist on “Black Theater Town Hall: The New Black Conversation,” for the BRIC Arts Media in Brooklyn, N.Y.; “Urban Circuit,” for the August Wilson Center for African American Culture in Pittsburgh, Pa.; and “Exploring Commercial Theater, Linking Platforms: Theater and Digital Media in the 21st Century,” for the Black Women Playwright’s Group in Skokie, Ill.
Shaw, who resides in Meriden, is a self-proclaimed popular culture addict. She also enjoys traveling to new locales and sampling different cuisines.